Here at Drexel, we work with your strengths, expand your capabilities, and give you the tools, resources, and experiences you need to fulfill your passion and take charge of your career. Specialize in Arts Administration or in Museum Leadership to create your future as an adaptive, resourceful, strategic, and connected leader through our renowned Arts Administration & Museum Leadership program. 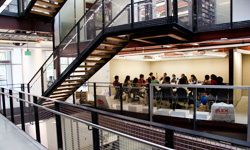 By joining this prestigious graduate program with over 45 years of accomplishments, you’ll integrate theory into practice, connect with leading arts and cultural executives, and learn from professors who are at the forefront of contemporary issues and practices that reflect the future of arts, culture, creativity, and community. Our contemporary and comprehensive curriculum addresses a broad range of leadership skills in the performing arts, visual arts, multidisciplinary, interdisciplinary, and emerging art forms. Attend full-time or part-time. Complete your degree in as little as 15 months or at your own pace. Take your courses on campus, online, or both. Evening classes allow you to work while you earn your degree. Experiential learning through course engagement with the Philadelphia region’s diverse arts and cultural community. Study with renowned Arts Administration faculty, who are prominent scholars and connected leaders. No GRE required (we focus on you, not your test scores). Incorporates museum planning and design, collections, and resource development into a comprehensive plan of study. Gain hands-on experience through practicum projects in Philadelphia’s diverse museum sector. Museum Leadership faculty bring diverse, extensive experience from the field into the classroom. Apply by June 30, 2019 and still be eligible for academic fellowships. The Drexel Arts Administration & Museum Leadership Graduate Programs are proud members of leading arts service and education organizations, including the Association of Arts Administration Educators, Americans for the Arts, and the Greater Philadelphia Cultural Alliance.